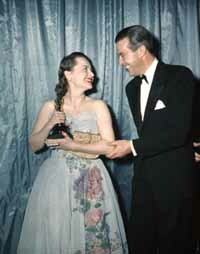 Best actress Academy Award winner Olivia de Havilland with presenter Ray Milland at the 1947 Academy Awards ceremony. © A.M.P.A.S. The Academy of Motion Picture Arts and Sciences has announced that two-time Oscar-winning actress Olivia de Havilland, 89, will be honored with an Academy Tribute on June 15. De Havilland, the sole surviving star of Gone with The Wind, will travel from her home in France to the Academy's Samuel Goldwyn Theater in Beverly Hills for the event, which will feature film clips and a discussion with friends and co-workers. Besides Gone with the Wind, for which she was nominated for a Best Supporting Actress Oscar (she lost out to Hattie McDaniel in the same film), de Havilland's most important films include Max Reinhardt's elaborate adaptation of Shakespeare's A Midsummer Night's Dream (1935), in which she plays Hermia; Captain Blood (1935), her first pairing with Errol Flynn (they romanced each other in no less than 8 movies); the rousing The Adventures of Robin Hood (1938), also with Flynn; Hold Back the Dawn (1941), in which she falls in love with illegal border-crosser Charles Boyer; In This Our Life (1942), holding her own opposite Bette Davis in this melodrama of love, deception, and bad genes; To Each His Own (1946), a highly melodramatic tale of mother-love and illegitimacy that brought de Havilland her first Oscar (and increased her status in Hollywood in the aftermath of a nasty, three-year court battle against her - by then former - studio, Warner Bros.); The Snake Pit (1948), an earnest plea for the humane treatment of mental patients; The Heiress (1949), a solid drama that deservedly brought the actress her second Oscar; My Cousin Rachel (1952), taken from a Daphne Du Maurier novel; and two 1964 thrillers, Lady in a Cage, as the dowager terrorized by hoodlums while trapped in an elevator, and the Southern Gothic Hush. . . Hush, Sweet Charlotte, getting even with Bette Davis. Among the directors with whom she worked were Robert Aldrich, Michael Curtiz, Victor Fleming, Lewis Gilbert, John Huston, Henry Koster, Stanley Kramer, Mitchell Leisen, Anatole Litvak and William Wyler. Tickets for An Academy Tribute to Olivia de Havilland will be available from June 1, for $5 for the general public and $3 for Academy members. I'm sorry, Leonard, but I don't have Olivia de Havilland's contact information. The Academy of Motion Picture Arts and Sciences' Margaret Herrick Library in Los Angeles may have a directory containing that information. Good luck! I had the honor of chauffeuring Olivia in 1984, to the Ritz Carlton in N.Y. I'm now an avid fan. I wanted to know how she has maintained relative anonimity in a place near Paris, France. If there was a way we could communicate to her, I'd like to keep in touch. Her contritution to the industry is enormous after the case she won for actors in the 1940's. Today, many have achieved greatness due to her, and Olivia deserves all the respect and recognition. No finer human being preserves an image most of us just simply adore. Thanks Olivia.